One year, six months, and twenty-five days since logging in for the first time onto KanColle, and deciding to do a 555/555/555/555 build to clear the first crafting tutorial, I got to achieve one of my goals. There was no doubt on who the Admiral wanted to marry. Zuikaku looked out into the approaching dawn, her bow in hand and hair fluttering in the fresh ocean breeze. The Combat Fleet of the Fleet of Beyond Hopeless had sortied in the early morning to patrol the Orel Sea. Zuikaku was the flagship, with Hyuuga and Haruna in tow as escorts, they were bringing along Kinugasa and Souryuu out for the experience. Not that the carrier with hunter’s green hair could advance. Other fleets, other Zuikakus, had been maxed at the highest level possible. She meanwhile, would be left to stay in her level. All due to the stupidity of her admiral. The carrier nodded, looking back at the speaker. Hyuuga was the Admiral’s second battleship, and she couldn’t help but feel a twinge of jealousy as she remembered the time where the much more mature acting heavyweight was the flagship for the Admiral’s efforts in clearing world 2 and his first events. Until the Kongous showed up of course. She turned her head to the side and watched as the ashen haired fast battleship steamed at the rear of the formation. Hyuuga lifted her flight deck shield. Unlike hers, or for that matter, Jun’you’s, Hyuuga and her sisters, alongside Mogami and her sisters, utilized shields that doubled as launchers. The seaplanes they launched were excellent scouts, though the Zuiun that Hyuuga just launched did well for attacking as well as her own planes. Hyuuga had one hand to her ear, waiting for a report from the Zuiun. Zuikaku nodded, as she stepped to the side and Souryuu took her place beside her. Both launched their first attack wave with well practice precision, and alongside a few fliers from Hyuuga, they settled back to their formation as the submarine in their force, U-511, dove down to launch her own preemtive attack. “Let’s be about it.” Zuikaku said, as she led her fleet into the damaged enemy formation. Lorenzo sat in his office, mimicking the well-known ‘Gendou pose’. The sun was just rising over the foothills of the mountainous realm that was his Guardian Office. He was based in Hittokappu Bay Anchorage, his office one of the myriad little spheres floating in the soft blue glow, connected by dotted leylines to the ‘world gate’. If one would peer beyond the horizon, past one’s own guardian office, one could see the other lines from other offices. Each Admiral could tailor their office to their own wishes and desires. Many prefer to leave it in the default world, one that had cool breezes and the people of the land that seemed less Japanese and more Russian. Ooyodo stood near him, her ever present clipboard and quill at hand. She didn’t have her fitout on, and was watching her Admiral intently. She had been privvy to the ins and outs of the naval base since its inception a year and six months ago. The man behind the cloth covered desk was one prone to moods, especially from the various winds and opinions of his fellow admirals. His psychological profile was…colorful but he manages to keep it together. Sometimes. But she couldn’t help but feel like she needs to reach over and slap some sense into him. A small box, covered in blue cloth was laid on top of an even more exquisite set of parchment. A soft white glow, tinged with golden rays from the sun that was rising steadily over the mountains of the Guardian Office, framed the parchment. A fountain pen was near the box and on top of the papers, and the whole arrangement was floating on a disc of pure white light, soft to the touch it would seem. Lorenzo was staring intently at it. Ooyodo averted her gaze slightly, knowing the mechanics of the world meant through hell or high water, she could not award him the rewards until he had cleared the quests he had chosen. Zuikaku put the golden compass away. A fairy had shown them the way, and they sailed, stopping by two nodes on the way where they obtained some ammo and fuel. At the fuel node, Zuikaku took out the compass. Your orders. Sail to Orel and pay another visit to the horned node. She poked the side, and watched as the compass floated before her, a fairy with a little wizard’s cap and a wand spun it, the red arrow staying still as the base spun, before it stopped, leading them to the horned node. There was no squeaks of fear or murmurs, only determination. Especially from the level ninety-nine flagship carrier. Lorenzo tipped back on the chair, signing off on some appropriations paperwork. Ooyodo had finished the necessary work, and all he needed to do was sign it. Putting pen to paper, his signature was a mixture of block and cursive, large exaggerated L and R with tinier words for the rest of his name. He can’t help but underscore the signature with ‘Admiral, Fleet of Beyond Hopeless’. Putting the report on his outbox, he can’t help but look back at the name. The girls were naturally distressed, when in a fit of his moods, he had come to label the fleet as that. The harsh words of fellow teitoku due to his poor showing at one event had led him to spiral into depression and self loathing. Something he fellow teitoku had already known to ignore. Another though had given him a list, and told him to get started. Rather than rejecting it, Lorenzo had taken it to heart, leveling and bringing about much needed changes to his fleet. But still, he stuck with the name. The opening stages were much the same, as Hyuuga reported back the finding of her scout. And much like the earlier node, Zuikaku, Souryuu, and Hyuuga launched their planes, only to be countered by the two enemy Wo class carriers. A terrific dogfight happened between the two fleets, but thanks to the Reppus and the fairies that piloted them, Combat Fleet of the Fleet of Beyond Hopeless encountered less torpedo bombers, and in a greater state of disarray, that led them to easily dodge the oncoming attacks. The abyssals though, not as lucky, with the one Ri class CA moderately damaged, the Ru class damaged and the Ni class destroyer sinking outright. Yuu’s preemtive strike took out the Ri class that had escaped the aerial phase. The two lines sped towards together, neither side obtaining the advantageous ‘T-cross’. But it seemed the earlier attack had broken down the communications within the enemy force. Hyuuga managed to fire the first shot, sinking the damaged Ri. The Ru class battleship levelled her guns at Zuikaku, who danced at the shells aimed for her. Haruna responded in turn, her guns covering the Ru in explosions that obscured her from view before she reappeared, looking worse than she did before eating Haruna’s shells. Kinugasa followed it up by sinking the standard Wo in a double volley, before Zuikaku, steading herself after her evasive maneuvers, drew an arrow from her quiver. The auspicious crane notched the arrow onto the string and pulled, releasing it at the right moment. The plane-tipped arrow would burst into a squadron of dive bombers, headed straight for the Ru class Battleship. Her aim was true, the fairies in the planes following the guiding aim from Zuikaku, sunk the Ru. In one final act of defiance against the stronger kanmusu, the remaining Wo launched an attack on Souryuu, resulting in some damage. Angered by this, Souryuu and Zuikaku launched a wave at the Wo. While the Wo managed to evade Zuikaku’s planes, she was damaged by Souryuu, before Hyuuga finished her off. Lorenzo looked up at Ooyodo, nodding pensively. Before he could say a word, Ooyodo continued. “Due to that, I acknowledge the completion of the quest.” She said, and in a flash of light, the papers appeared on his desk. Picking the ring up with some trepidation, he pocketed it in one of the many pockets of his khaki pants. Adjusting the heavy belt he wore that bore the weight of his pistol, he strode over to the coatrack and grabbed his cap. Unlike other admirals who stuck with the white or black IJN uniforms, he had opted instead to just borrow a set of BDUs. Saluting the men that were around doing various improvements around the naval base, he patted Akatsuki’s head, much to her annoyance, before heading out to the docks. Peering out into the horizon, he waited until he could see Combat Fleet coming in. Support and both Expedition fleets were already out for their daily quests, and it seems the base’s stockpile is at least stable. Unlike other times, where he would normally just receive and acknowledge the return of a fleet from runners or Ooyodo, he was there to welcome the fleet home today. Something that seemed, out-of-place for Zuikaku, seeing a slightly portly young man waiting behind the controls of a RHIB. Puzzled, the fleet lined up for their debriefing. “Combat Fleet of the…the Fleet of Beyond Hopeless has arrived from Sortie, Admiral.” Zuikaku reported, saluting him. Lorenzo returned the salute and started up the engines of the RHIB. “Dismissed, take a break, Souryuu head to the docks. 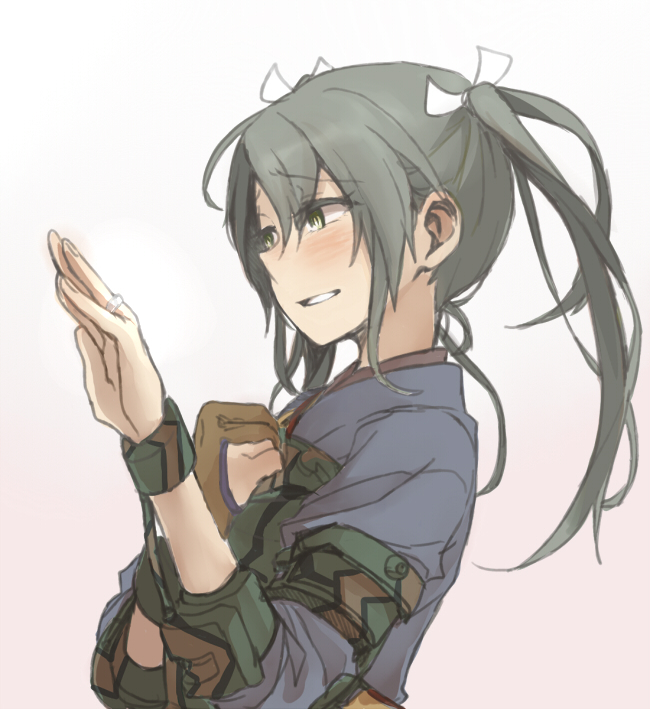 Zuikaku, if you please, follow me?” He said, as he pushed off the dock and headed inland. Zuikaku followed as they made their way up river. The Fleet of Beyond Hopeless’ Guardian Office was set in a world sphere within the Hittokappu Bay Anchorage, again, one of many floating around and connected to ‘the world’. As discussed, the Admiral could shape his or her sphere to whatever he/she wanted, and many have. Lorenzo though, would push the boat up the river, with Zuikaku following suit. Soon, after rounding a bend on the river, all view of the base disappeared behind some pretty impressive mountains. Modelled after the banks of the Shenandoah River, the breeze was cool and inviting, the majesty of tree covered forests stretching before him. Zuikaku merely followed, knowing exactly where he was taking her. Zuikaku watched as he maneuvered near a floating pier. Cutting the engine and tying himself to it, he got out and walked to land, while she merely followed. They would walk a little bit to a clearing, where a small little one room cabin would be seen. Punching in the combination to a key locker on the side, Lorenzo opened the door to the cabin, finding the things inside still neat and orderly. Opening the door to the front patio, it provided a nice view of the river below them, and in the distance, the tops of the container cranes in the harbor. She turned to look at him, only to see his face a foot or so away from her. Lorenzo pulled out the ring from his picket, the blue box hidden in his palm, as Zuikaku got extremely flustered and started to yammer away at needing personal space and his face being too close. He pulled back, and presented the ring to the carrier that has been an integral part of his fleet, a part of his life, and one of the few things that kept him sane for one year, six months, and twenty-five days. This entry was posted in Kantai Collection, Life, Video Games, Writings and Roleplay. Bookmark the permalink.